Over the last eighteen months people from Sussex and Lower Normandy have exchanged orchard skills, knowledge and enthusiasm. On two of our trips, Orchard without Borders visited La Blutellerie, near La Ferté Macé, home to an organic orchard of dessert apples. This was of particular interest to those visitors who were keen to learn more about how fruit can be produced commercially following organic principles. Organic apple growers face a difficult task, and methods vary enormously between organic orchards in England, so learning about the approaches Bruno Liehn has evolved through experimentation (and chance) was fascinating. We gathered quite detailed information from Bruno about his methods. We also learnt that he grows substantial amounts of fruit on ‘own-root’ trees. The article below summarises the information we gathered. The author, Peter May, is a horticulturalist who has propagated over a thousand Sussex apple trees. He is jointly responsible for the management of several community orchards and runs regular courses for Brighton Permaculture Trust and Plumpton Agricultural College on a range of orchard skills. He is also co-author of Apples and Orchards in Sussex. Over the past couple of years, people have been sharing orchard skills across age groups, across the professional/community divide and … across the Channel. Organisations in Sussex and Lower Normandy have transported vanloads of local variety apple trees to create ‘bilingual’ small orchards in 10 schools and community settings with hundreds of children and adults in both regions. Dozens of people have attended workshops in grafting, pruning, cookery, juicing, cider and calvados production, orchard design, the birdlife of orchards and have participated in each others’ public events. We also visited orchards – large and small, professional and community, rural and urban. One of the most interesting orchards we visited was the organic orchard run by Bruno Liehn. The organic orchards and grazing land of La Blutellerie farmed by Bruno Liehn lie in an open landscape of farmland, hedgerows and small woods a few kilometres from Lignères-Orgères in Lower Normandy. The soils are clays and sandier soils which overlie the granites of the Armorican massif. There is good drainage on the sandier soils but, where there are hard sandstones and clays, drainage is poor. While many of the orchards in this part of Normandy characteristically have large cider and pear trees undergrazed by cattle and sheep, the organic orchards at La Blutellerie are mainly dessert apples with varieties like Topaz, Reinette Grise du Canada, Dalinette, Benedictin, Calville Blanc, Goldrush, Pilot and the distinctively marked Patte de Loup or “Paw of the Wolf”. Evereste and Golden Gem crab apples are interplanted in the rows as pollinators, and there are also beehives. With 17 ha of pasture and 5.5ha of orchards, the trees are grown on a post and wire framework with a main central stem and a radial or “centrifugal” pattern of branches to allow as much light as possible to reach the fruit. Vertical, tightly angled branches and strongly growing branches are pruned out. The remaining widely spaced branches can then be tied down if necessary onto the framework to increase fruit bud formation. The rootstocks used are M9, M111 and Bittenfelder, a seedling rootstock. Seedling rootstocks like Bittenfelder are commonly used in Normandy, where they are grown from the seeds of parent trees of known vigour in Dutch nurseries. Many of the trees are “top-worked” or cleft grafted with the fruiting variety onto a Golden Delicious or Akane interstock. A proportion of the trees are also grown up from the rootstock without the use of an interstock. On the light soils at La Blutellerie, the trees are planted into ground which has first been rotavated to break up the grass sward and then futher broken down with a “Rotabeche”, a tractor-mounted cultivator. The rows are planted in a north-south direction, 5m apart and 2.5m between each tree. Grass is allowed to grow around the tree rows, as Bruno thought this improved soil biodiversity. He commented that when strips of bare soil are left along the line of trees, a practice that is characteristic of intensive commercial orchards, it exposed the surface roots to drying out. Irrigation is required on the sandier well-drained areas of the orchard, and this is provided by a borehole and a water storage lake in the valley below La Blutellerie. An overhead irrigation line with spray nozzles runs along the length of each row of trees, and the fine mist from these provide frost protection. The ice forming on the flowers from the fine water spray prevents temperatures falling below minus 1 centigrade and, as long as this gradually melts, the damage to the flowers from freezing is prevented. Bruno thought that one year in six were bad frost years at flowering time. Sheep graze underneath the trees as part of the cycle of production. The 20 Shropshire sheep are bought in from Austria and act as “lawnmowers”, keeping the grass down, with meat as a valuable by-product. They also manure the ground around the fruit trees and are an important way of maintaining soil fertility. By closely cropping the grass and feeding on windfalls, the sheep reduce the population of codling moth caterpillars that cause damage to the fruit in apple orchards. Following our visit, members of the group from HFT in Walburton, West Sussex, introduced sheep to their orchard. Some of the lowest branches of the trees are grazed off by the feeding sheep. Bruno said that the sheep usually graze the grass and only tended to feed on the lower branches of the apple trees when there was not enough grass to eat. He chose Shropshire sheep as this breed is less inclined to eat tree leaves and bark than most. “BSC Italienne” or Lime Sulphur is sprayed onto the trees to prevent scab, with the numbers of applications dependent on the weather conditions and the susceptibility of the apple variety to the disease. This might be ten times during spring and summer and up to thirty times in “bad” scab years or with susceptible varieties like Goldrush. Reinette d’Armorique and Patte de Loup are tolerant of scab with little damage to the fruit. Lime is also sprayed onto the rows of trees at the end of the winter to reduce the amount of canker present with milk casein used to help the lime bind onto the trees. Copper is used as a fungicide mixed with linseed. The mixture, when soaked in vinegar, forms an emulsion which helps the copper to remain on the trees after rain. Rosy Apple Aphid is the insect which causes greatest damage to the leaves on the trees, and Neem oil and Pyrethrum are applied as insecticides. Wild areas are left as a habitat for the beneficial insects that are predators of aphids in the orchards, though Bruno had to remove some of the hedgerows that divide the orchards because flocks of chaffinches and bullfinches were eating the fruit buds. On one of the beds of trees grafted onto an M9 rootstock, voles had ring barked the trees at soil level. Rather than remove the damaged trees and replant with new varieties, Bruno earthed up the soil around the base of the trees, which had encouraged them to produce their own roots. Without the dwarfing effect of the rootstock, varieties like Pilot and Goldrush were growing to 5-6m+. Despite the lack of control in the eventual size of the trees, trees on their own roots are likely to be healthier, as the supply of nutrients is determined by its own roots rather than by a rootstock which may have different nutrient requirements. Bruno thought the M111 rootstock was resistant to vole damage. 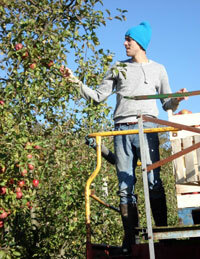 Bruno’s orchard is a rare example of own-root apple trees in a commercial orchard. One disadvantage of having such high trees is that it makes picking more difficult, and, on the day of our visit, a mobile hydraulic platform was being used to enable the fruit to be picked before it is packed or stored in the coldstore by the Lignères Orgères road. Bruno is a member of the Percheron collective, which is a group of organic producers near the town of Alençon who market a wide range of agricultural products from fruit, vegetables, bread and flour to meat, dairy products and sunflower oil. The co-operative markets the apples produced at La Blutellerie to customers in Paris, and the fruit is also sold to school canteens and a large market in Caen and to customers visiting the farm. The visit was arranged by Evelyne Ramon of CPIE (Centre Permanent d’Intiatives pour L’Environnement) Collines Normandes in Normandy and Anne-Marie Bur of the Brighton & Hove Food Partnership and Brighton Permaculture Trust. An exhibition about orchards in Sussex and Normandy, a collaborative production in both French and English versions, is available for loan from the Food Partnership.